Gustáv Husák (in the middle) in 1971 on a visit to the GDR. 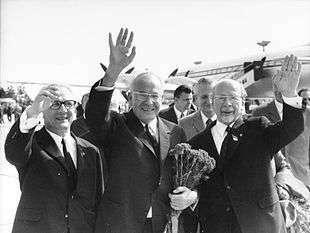 Walter Ulbricht and Erich Honecker are also pictured. Gustáv Husák (Slovak pronunciation: [ˈɡustaːu̯ ˈɦusaːk]; English /ˈɡuːstɑːv ˈhuːsɑːk/, /-æk/; 10 January 1913 – 18 November 1991) was a Slovak politician, president of Czechoslovakia and a long-term Secretary General of the Communist Party of Czechoslovakia (1969–1987). His rule is known as the period of the so-called "Normalization" after the Prague Spring. Gustáv Husák was born as a son of an unemployed worker in Pozsonyhidegkút, Pozsony County, Kingdom of Hungary, Austria-Hungary (now part of Bratislava, Slovakia as Dúbravka). He joined the Communist Youth Union at the age of sixteen while studying at the grammar school in Bratislava. In 1933, when he started his studies at the Law Faculty of the Comenius University in Bratislava, he joined the Communist Party of Czechoslovakia (KSČ) which was banned from 1938 to 1945. During World War II he was periodically jailed by the Jozef Tiso government for illegal Communist activities, and he was one of the leaders of the 1944 Slovak National Uprising against Nazi Germany and Tiso. Husák was a member of the Presidium of the Slovak National Council from 1 September to 5 September 1944. After the war, he began a career as a government official in Slovakia and party functionary in Czechoslovakia. From 1946 to 1950, he acted as a quasi-Prime Minister of Slovakia, and as such he strongly contributed to the liquidation of the Democratic Party of Slovakia. That party had taken 62% in the 1946 elections in Slovakia, thus delaying the Communist takeover of Czechoslovakia by two years. In 1950, he fell victim to a Stalinist purge of the party leadership, and was sentenced to life imprisonment, spending the years from 1954 to 1960 in the Leopoldov Prison. A convinced Communist, he always viewed his imprisonment as a gross misunderstanding, which he periodically stressed in several letters of appeal addressed to the party leadership. It is well known that party leader and president Antonín Novotný repeatedly declined to pardon Husák, assuring his comrades that "you do not know what he is capable of if he comes to power". As part of the De-Stalinization period in Czechoslovakia, Husák's conviction was overturned and his party membership restored in 1963. By 1967 he had become a critic of Novotný and the KSČ's neo-Stalinist leadership. In April 1968, during the Prague Spring under new party leader and fellow Slovak Alexander Dubček, Husák became a vice-premier of Czechoslovakia, responsible for overseeing reforms in Slovakia. As the Soviet Union grew increasingly alarmed by Dubček's liberal reforms in 1968 (Prague Spring), Husák began calling for caution. After the Soviets invaded Czechoslovakia in August and he participated in the Czechoslovak-Soviet negotiations between the kidnapped Dubček and Leonid Brezhnev in Moscow, he suddenly became a leader of those party members calling for the reversal of Dubček's reforms. An account for his pragmatism was given in one of his official speeches in Slovakia after the 1968 events, during which he ventured a rhetorical question, asking where his opponents (supporters of opposition against the Soviet Union) want to find those "friends" of Czechoslovakia (countries in Europe) that would come to support the country (against Soviet troops). Supported by Moscow, he was appointed leader of the Communist Party of Slovakia in as early as August 1968, and he succeeded Dubček as first secretary (title changed to general secretary in 1971) of the Communist Party of Czechoslovakia in April 1969. He reversed Dubček's reforms and purged the party of its liberal members in 1969–1971. In 1975, Husák was elected President of Czechoslovakia. During the two decades of Husák's leadership, Czechoslovakia became one of Moscow's most loyal allies. In the first years following the invasion, Husák managed to appease the outraged civil population by providing a relatively satisfactory living standard and avoiding any overt reprisals like was the case in the 1950s. His regime was not a complete return to the heavy-handed Stalinism that prevailed during the first 20 years of Communist rule in the country. At the same time, the people's rights were somewhat more restricted than was the case in János Kádár's Hungary and Josip Broz Tito's Yugoslavia. Indeed, on the cultural level the level of repression approached that seen in Erich Honecker's East Germany and even Nicolae Ceauşescu's Romania. Under the cover of everyday stability, there was a permanent campaign of repression by the secret police (StB) targeted at the outspoken dissidents represented later by Charter 77 as well as hundreds of unknown individuals who happened to be targets of the StB's pre-emptive strikes. The repression intensified over the years as Husák grew more conservative. Starting in the early 1970s, Husák allowed those who had been purged in the aftermath of Prague Spring to rejoin the party. However, they were required to publicly distance themselves from the "errors" they had committed. The latter part of Husák's tenure saw a struggle within the Politburo over whether to adopt Gorbachev-style reforms. While the hardliners, led by Vasil Bilak, opposed any restructuring, moderates led by Prime Minister Lubomir Strougal strongly favoured reform. Husák himself stayed neutral until April 1987, when he announced a somewhat half-hearted reform program scheduled to start in 1991. Later that year, however, Husák yielded his post as general secretary to Miloš Jakeš in response to a desire for younger leaders (Jakeš and Ladislav Adamec) to share in power. On November 24, 1989, the entire Presidum of the Communist Party, including Husák, resigned. The party officially abandoned power four days later. Husák remained as president until 10 December, when he was forced to swear in the country's first non-Communist government in over 40 years. He resigned just hours after presiding over the formal end of the regime he had largely created. In a desperate attempt to rehabilitate its image ahead of the first free elections in 44 years, the Communist Party expelled him in February 1990. He died, almost forgotten, on 18 November 1991. There is still some question about Husák's moral responsibility for the last two decades of Communist rule in Czechoslovakia. After its collapse, Husák kept saying that he was just trying to diminish the aftermath of the Soviet invasion and had to constantly resist pressure from hard line party Stalinists such as Bilak, Alois Indra and the like. It is true that in the early 1970s, he personally pushed for an early withdrawal of the Soviet troops from Czechoslovak territory, which did not happen until 1991; this may be ascribed to his pragmatic attempts to ease the situation and to give an impression that things were leaning toward "normality". However, there are many irrefutable facts convicting him of a great deal of personal contribution to the regime's nature. As the General Secretary of the Party, he was well able and willing to control the repressive state apparatus. There are many documented cases of appeals from politically persecuted persons, but almost none of them was given Husák's attention. As the overall decay of Czechoslovak society was becoming more and more obvious in the 1980s, Husák became a politically impotent puppet of events. Gustáv Husák was awarded the title Hero of the Soviet Union on 9 January 1983. Wikimedia Commons has media related to Gustáv Husák.